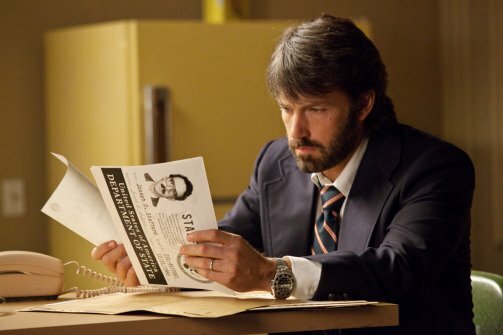 The real-life story behind Ben Affleck's Argo is so fantastically strange that even a mediocre talent could create a solid film from it. Considering that Affleck has demonstrated with his first two directorial efforts (2007's Gone Baby Gone and 2010's The Town) that he is much more than a mediocre film-maker, it should come as no surprise that he has managed to turn a thrilling true story into a thrilling feature film. Yet in telling the story of how the CIA created a fake movie in order to help people in real danger, he comes dangerously close to out and out lying in service of the story. Whilst it seems apt, given the story, it also verges on being irresponsible. After a brief pre-credits sequence laying out a broad and somewhat hurried history of the United States' relationship with Iran during the twentieth century, Argo's genuinely amazing - not to mention actually genuine - story begins on the 4th of November, 1979, the day when the American Embassy in Tehran was seized and many of those inside were taken hostage. During the confusion, six Embassy staff managed to escape and take refuge under the protection of the Canadian Ambassador (Victor Garber). Given the volatility of the situation and the fear that the Iranian police will figure out that some people managed to get out, the CIA try to figure how to covertly sneak them out of the country. Tony Mendez (Affleck) comes up with the idea of setting up a fake film to help extract them; he'll enter Iran claiming to be scouting locations for the production, then leave with the embassy staff, who will pretend to be part of a Canadian film crew. Everyone realises that it's a terrible idea that almost certainly won't work, but considering the only other option involves having them cycle cross-country, it's the least terrible idea the CIA have to work with. The need to spend time so much time in Hollywood stops the film from building up much momentum until Mendez makes the journey to Iran. There are brief moments of tension when members of the Canadian ambassador's household start asking just who his house guests are, as well as ones in which the six "guests" witness violence from a distance to raise the stakes, but there's always the sense that nothing too bad is going to happen until the escape gets nearer. It's only when things run the risk of going very badly wrong that the film gets really exciting. At any moment, the group could be pulled to the side by the authorities, or called out by an ordinary member of the public, and if they don't know their false identities completely, they could be taken away and killed. Even if they do know them chapter and verse, they could still be taken away and tortured until they admit what's really going on. Affleck fully exploits that tension, and the last half an hour of Argo is a flawlessly executed finale that builds beautifully as the group gets closer to escaping. It's also largely made up, and the point at which the film enters a weird area in which it trades in its carefully crafted authenticity - the details of the film are spot on, and the grain of celluloid adds to its period feel - for conventional Hollywood thrills and spills. But does that really matter? From an historical perspective, the film takes a few too many liberties, but from a dramatic perspective it works wonderfully because it ends the film on a crowdpleasing high. More importantly, it doesn't alter the events themselves, so much as heighten and embellish them. To quote Leonard Nimoy, it's all lies, but entertaining lies, and isn't that the real truth? The answer, is no, but at least it's a fun ride.